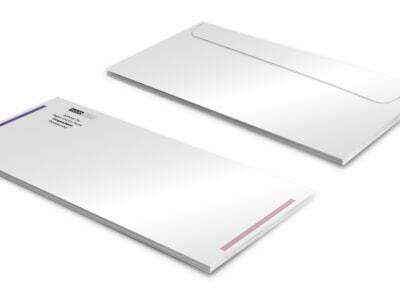 Every contact with your clients is an important one, so make a big impression by customizing envelopes for your agency using our insurance envelope templates. Our easy-to-use templates help you make fast work of creating envelopes that exude professionalism and class when you mail out invoices, quotes, promotional materials, and more. Upload your logo or a graphic to give your envelopes a standout look in your clients’ mailboxes, and use our online editor to add a tagline, message, and contact details. After you’re satisfied with your design, print your envelopes instantly using your own printer, or trust us to do the printing for you.